Remember the old days when the "Parkie" would yell at kids "Keep of The Grass"? 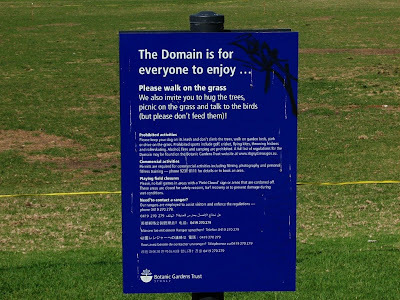 I do, which is why I like this sign in the Domain, erected by the Botanic Gardens Trust. "The Domain is for everyone to enjoy. Please walk on the grass. We also invite you to hug the trees, picnic on the grass and talk to the birds"